I have fond memories of working on woodblock printmaking at school. The usually noisy classroom would become soothingly quiet during art class, while everyone concentrated on their carving. I think it was in third grade that we first made woodblock prints. 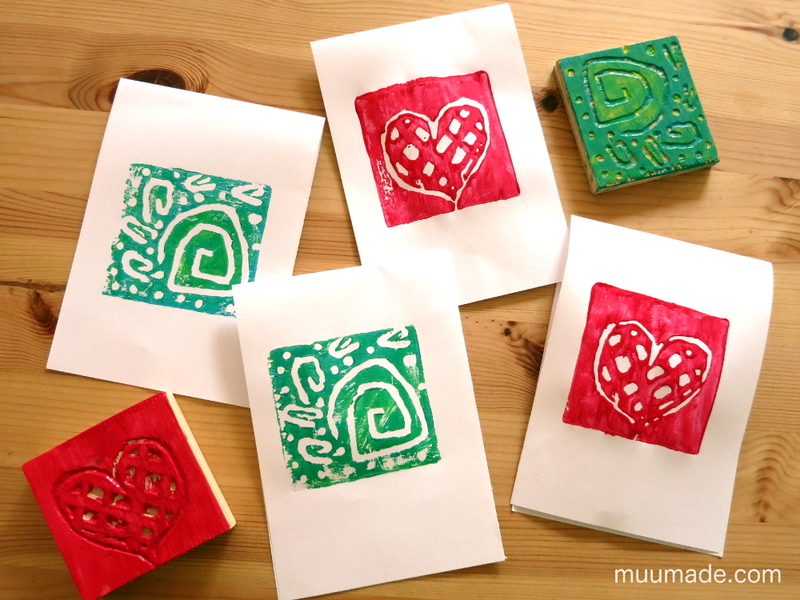 So, recently I decided that my daughter was old enough to work with carving tools and to have a go at woodblock printmaking. And sure enough, she enjoyed it very much! 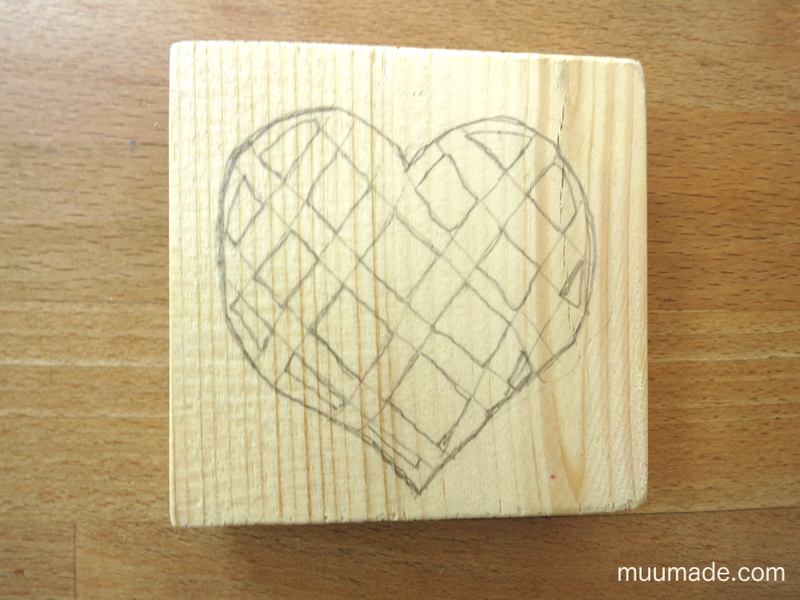 After experimenting with a few types of wood, we decided that the balsa was the best choice for our daughter. 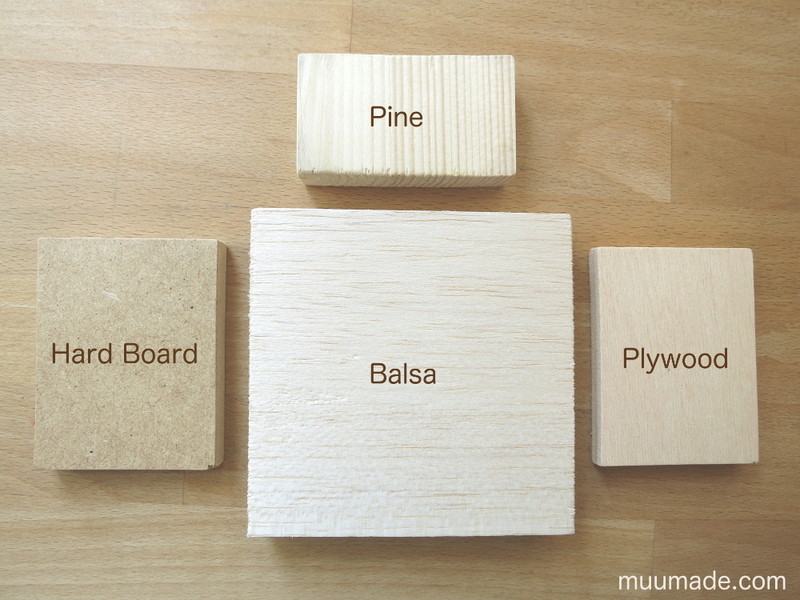 Balsa is very soft and light, so it can be carved very easily. However, its porosity is a downside. When you try to do fine work against its grain, small pieces often break off. 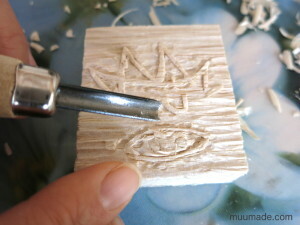 So, it is not ideal for detailed carving. Unfortunately, we don’t know what kind of plywood it was that my husband found at a local hardware store, but I recommend basswood plywood if you can find it. (That is what I used to use for printmaking at school.) I remember it being more dense and slightly harder to carve than balsa, but it did not splinter. Size-wise, around 10 cm (4″) x 10 cm (4″) is big enough to give you plenty of room to carve a simple design, while it is also small enough to allow you to finish the carving in one setting. To carve the wood, you will need a set of carving tools. Shown above is a Japanese set that we use and love. From left to right, they are: 1 sankaku-to (V-gouge) for carving deep and sharp lines, 2 maru-to (U-gouge) in two sizes for making nicely rounded traces, 1 kiridashi (small knife) for making thin but deep cuts around the outlines, and 1 hira-to (chisel) to make shallow and wide cuts that creates a somewhat transparent effect. 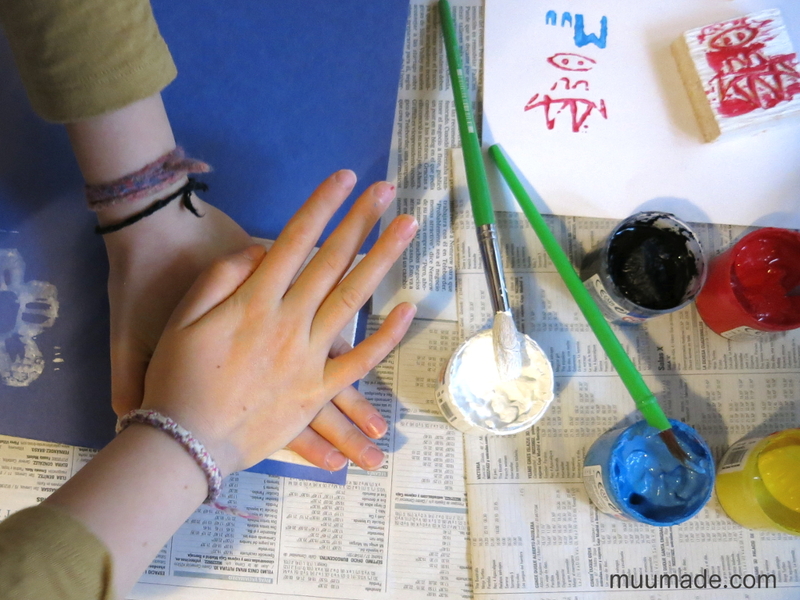 Other materials that you will use are: a pencil, tempera paint and paint brushes, paper, and plenty of newspaper to cover the work area. The easiest way to prepare a design for carving is to draw it directly onto the wood with a pencil. But, if you like, you can also prepare a design on a sheet of paper, and trace it onto the wood with tracing paper. Either way, remember that the image will be reversed when it is printed! 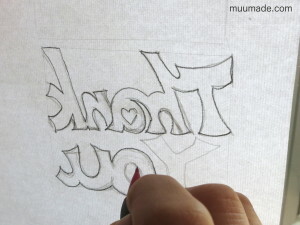 To make a mirror image of your design before copying it onto the wood, you can hold the sheet with the design up against a window (with the image side facing away from you), and trace the drawing onto the reverse side of the paper. Now, it is time to start carving! You can either carve the design itself and leave the rest untouched, so that the design will appear white against the background color of ink when printed. Or, you can carve out the background to elevate your design. With this technique, your design is that part that will appear in color when printed. In the photo, I am using the big maru-to (U-gouge) to make a roughly carved background. 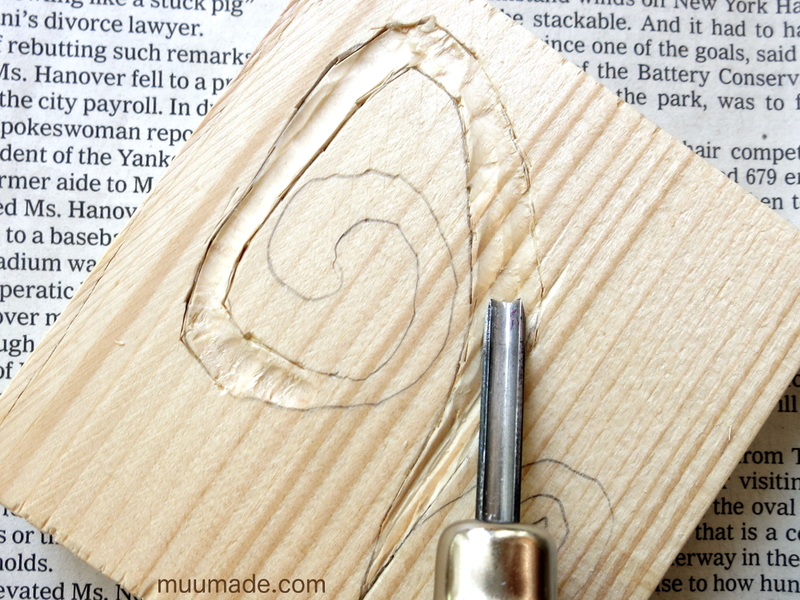 (Carving along the grain of the wood is the easiest!). For either method, it is a good idea to make thin deep cuts with the kiridashi (small knife) around the design before you carve. This is to prevent the carving knives from slipping into and ruining your design. When you are ready to print, apply tempera paint evenly and thinly over the surface of the print block. 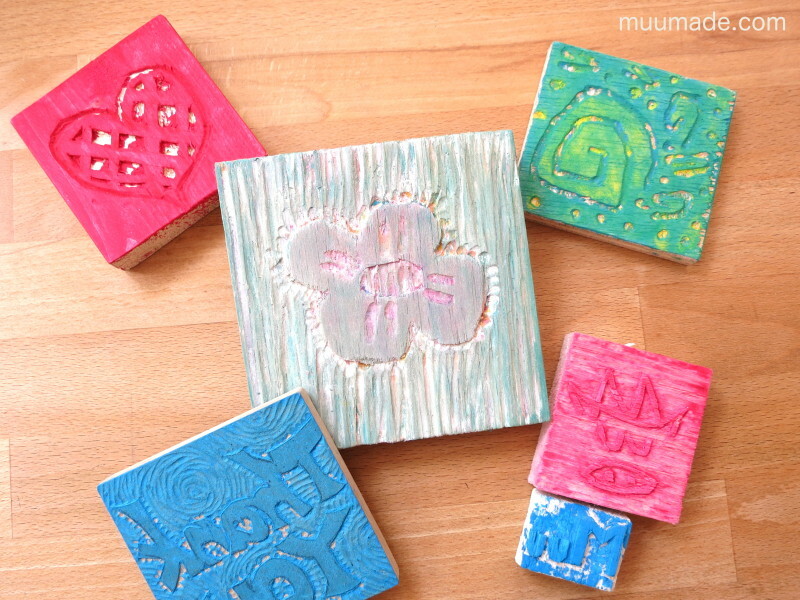 Two simple ways to print are: stamping and rubbing. 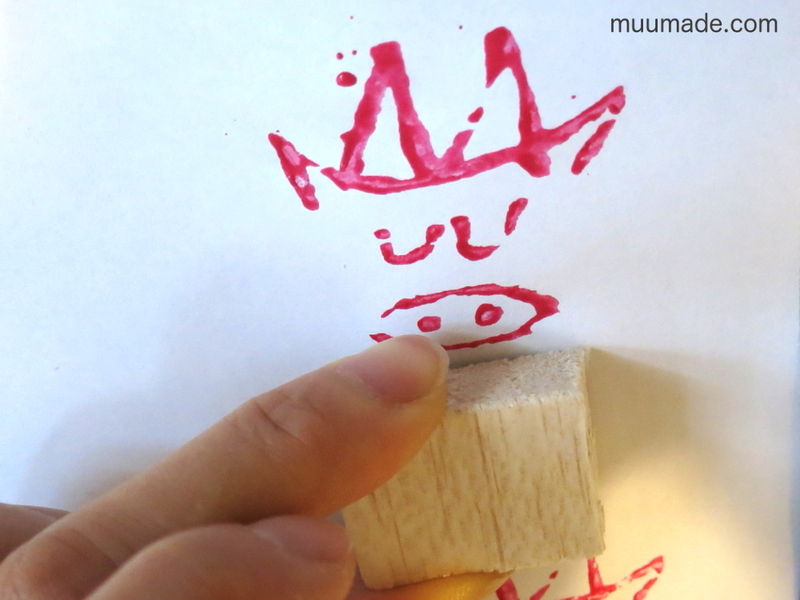 Stamping is literally using your print blocks as stamps. This method works best for relatively small pieces. Rubbing is another easy way to print, and I recommend it for pieces that are bigger than 5 cm (2″) on one side. First, place the print block on a flat surface with its carved side facing up (with paint already applied!). Then, place a sheet of paper on top. While making sure that the paper and the block stay in place, rub evenly and thoroughly over the area of the paper that is in contact with the print block. 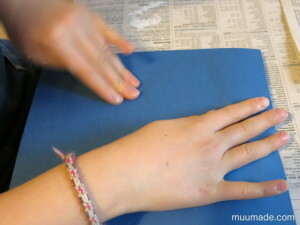 You can rub by hand, as shown in the photo, or with something flat. There is a disk-shaped rubbing devise called a baren, if you wish you purchase a tool specific for this purpose. Rubbing with something flat applies pressure more evenly against the print block and thus gives you a more even finish. Above is a comparison of the two types of printing. 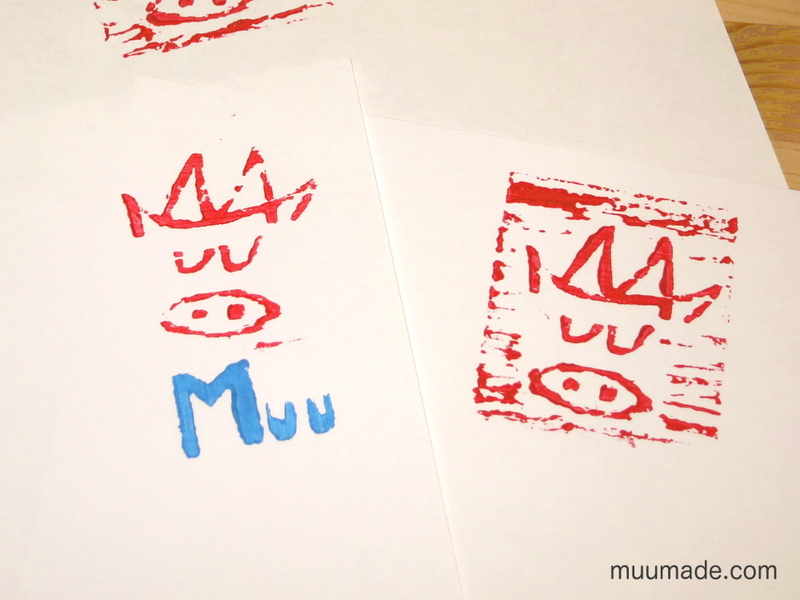 The two images of the Muumade cow were made from the same print block. But, the left print was made by stamping, the right one was made by rubbing. The carved lines in the background appear in the latter case because you can apply pressure more thoroughly to bring out more subtle lines when rubbing. 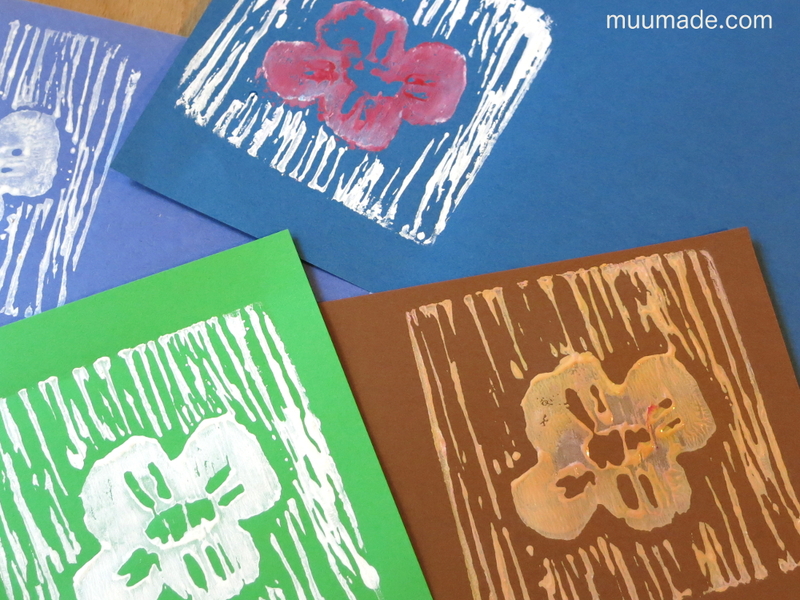 With tempera paint, you can apply multiple colors, like my daughter did with her flower prints, and also mix colors in any way that you wish! 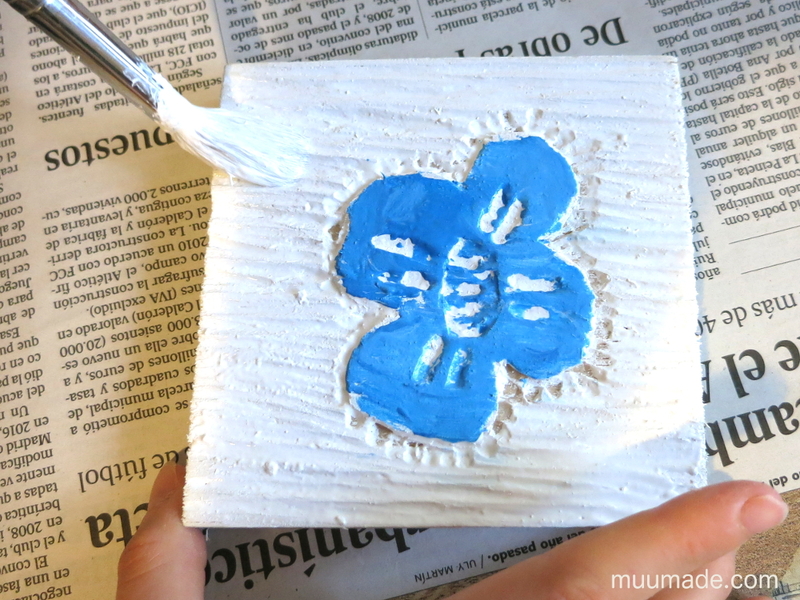 One thing to keep in mind when putting tempera paint onto the print blocks is to not apply it excessively or leave clumps of paint stuck in the grooves. Handmade prints make wonderful cards. They also look great when framed. And the best part is that you can make as many prints as you like! 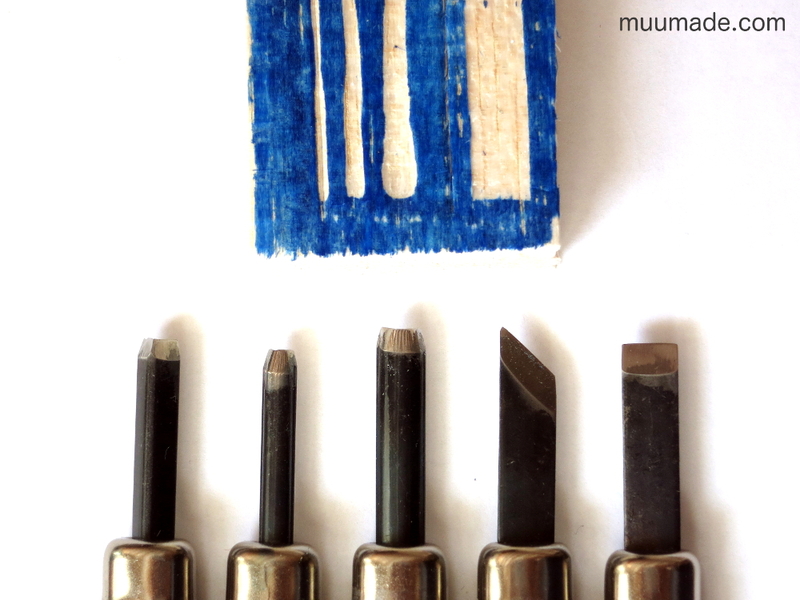 To share to your own hand carved prints, please visit Muumade’s Gallery.